The Russian Foreign Ministry has sharply criticised the decision by Britain to grant asylum to two Russian businessmen, Boris Berezovsky and Yuli Dubov. The ministry issued a strongly worded statement late on Wednesday in which it accused Britain of "unfriendly steps" that threatened to damage bilateral relations. Russia had been seeking the businessman's extradition from Britain on charges of fraud, which the men claimed were political. The extradition case was dismissed after the men were granted refugee status. Russia has expressed its official annoyance in the strongest terms. The Foreign Ministry statement calls London's decision "unfriendly" - a violation of international law. By opting to "harbour" the two businessmen, as Moscow puts it, London has undoubtedly harmed relations. The sharp reaction came a day after a court in London dropped extradition proceedings against Yuli Dubov. He had been granted refugee status by Britain a few days earlier. It was an exact repeat of proceedings surrounding Boris Berezovsky. The billionaire businessman left Russia three years ago after falling out with President Putin. He has since become a fierce critic of the regime, and claims the fraud case against him and his colleague is political. But the Foreign Ministry dismisses London's suggestion that the men would be victimised at home as "strange at the very least". Its statement suggests Russia had been hoping for more from Britain - co-operation in this high-profile case, perhaps - in recognition of improving relations. But the British courts failed to comply, leaving an angry Moscow lashing-out. 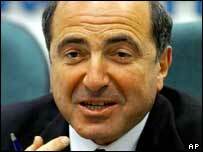 Boris Berezovsky is a real thorn in Russia's side, and the decision to grant him political asylum clearly grates here. It is not the kind of signal Mr Putin was looking for, as the election season hots up.